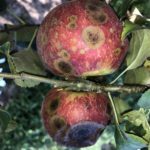 As harvest continues, so does the summer rot saga, especially bitter rot. Multiple orchards are reporting significant to complete loss of Honeycrisp throughout the Midwest, in addition to other varieties. Honeycrisp is by far the worst hit, but its seems that Golden Delicious, Granny Smith, Cameo, Ida Red, Empire, Fuji and Gala have had problems in the past. If you are having problems on other varieties, please let me know. We have a trial underway to see if a preharvest application of captan or Merivon helps improves long-term storage options. I’ll have the data to you for the winter horticultural congress in Indianapolis. Apple harvest is ongoing with Pixie Crunch being picked this week. 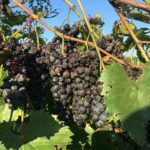 Grape harvest continues as the warmer conditions hasten ripening. Most growers are getting into late season varieties. Powdery mildew on grapes is worse than we’ve seen it in quite a while. 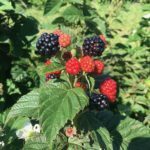 Primocane blackberry harvest continues and most cultivars are still blooming so there is potential for another month of harvest. Hopefully cooler weather will improve fruit quality. Red raspberry harvest is about over. Paw paw harvest is on-going as warm temperatures hasten fruit drop. Dr. Rick Foster spoke to the Hort 318 class this week about managing corn ear worm. The class also planted a fertilizer trial with cabbage, cauliflower, peas and beets. Grape harvest is underway for early and mid-season varieties. Downy and powdery mildew are showing up in vineyards. Table grapes have been especially nice this year. Primocane bramble harvest is also underway. 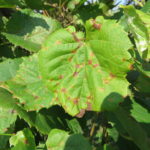 Surprising low number of spotted wing Drosophila have been found in grapes or brambles. 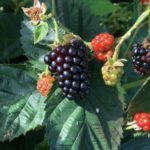 Frequent rains are very unwelcome as they generally have a negative effect on fruit quality in both grapes and brambles. Gala and Honey Crisp apples are being harvested. Weeds and row middle covers are growing excessively with all the recent rains.